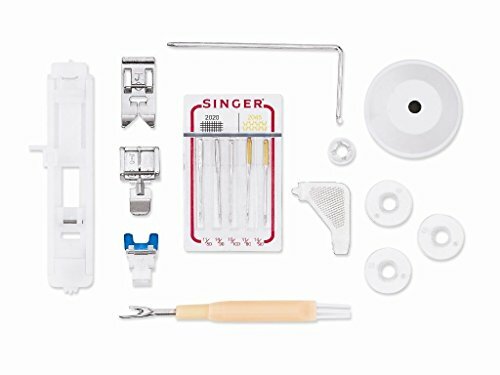 The Singer 4423 sewing machine is an inexpensive yet durable option for sewers looking to complete all types of projects. With a maximum sewing speed of 1,100 stitches per minute, this machine helps you sew faster, even through thick materials like leather. Plus, the 4423 is made with a metal interior frame and extra-strong motor, making it a heavy-duty model despite its low price tag. Very durable and heavy duty. Not only do you get a variety of different stitches to choose from with the 4423, but you also get to choose the width and length of each stitch. Width and length can be adjusted simply by using separate dials on the machine. Choose from 4 different lengths from 0.5 mm to 4 mm and 6 different widths from 0 mm to 6 mm. All of the presser feet listed above have a snap-on, quick release design. So, changing presser feet with the 4423 machine is as quick and easy as possible; switch from sewing a buttonhole to sewing on a zipper in a matter of seconds. The Singer 4423 even comes with a soft-sided dust cover so you can protect the machine while it’s not in use. This machine comes with on-board storage in the removable sewing bed for these included accessories. So, whatever you may need is always right within reach. The Singer 4423 sewing machine will quicken the sewing process and help you get those projects done faster. It has a maximum sewing speed of 1,100 stitches per minute--just think of how much you’ll complete with this ultra-fast machine! 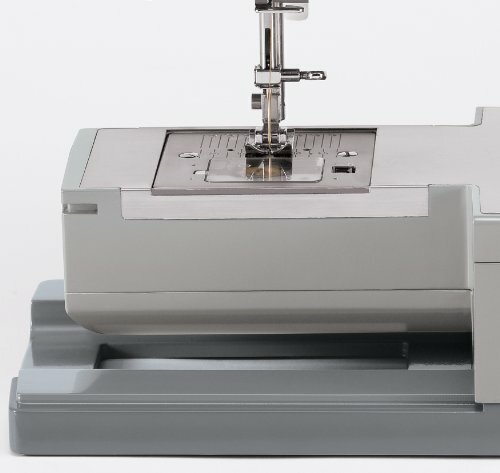 The 4423 features a motor that’s 60% stronger than a standard sewing machine. This allows it to not only sew faster, but also to handle heavy fabrics with ease. So, bring on the heavy fabrics like denim and fleece; the 4423 can handle it. 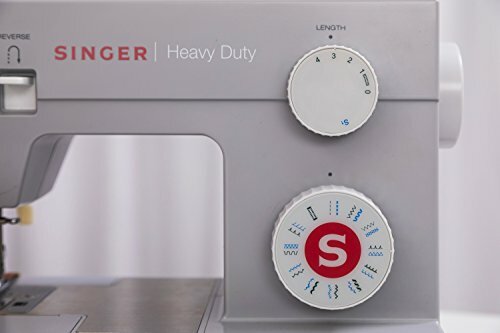 This exceptional sewing machine from Singer is constructed with a heavy-duty interior frame for additional support and stability. The frame is made from durable metal and the machine’s bedplate is made from stainless steel. You can trust that the 4423 will be around for years to come, even after hundreds of sewing projects. Despite its metal frame and powerful motor, the 4423 runs smoothly and quietly. When a sewing machine is quiet while in use, the process of completing a project is more peaceful--both for the sewer and anyone who happens to be nearby! This fantastic machine from Singer comes with a 25-year limited warranty. You can feel good about buying this machine knowing that your purchase is protected. Automatic needle threader: Avoid straining your eyes with the automatic needle threader. Just follow the threading path that’s printed on the side of the machine to get your needle ready to go with ease. Free arm: You can use the built-in free arm to achieve greater accessibility for tricky sections of projects like cuffs, hems, and collars. Top drop-in bobbin: Loading and unloading your bobbin takes hardly any effort with the drop-in bobbin compartment. With this feature, you can also keep an eye on how much thread you have left. 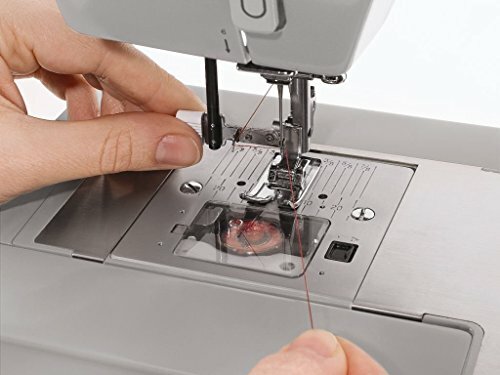 Fully automatic 1-step buttonhole: Create buttonholes in just a single step with the 4423. Extra-high presser foot lifter: Sewing through several layers of fabric can often be unwieldy. That’s why the 4423 machine has an extra-high presser foot lifter that accommodates even the thickest of materials. 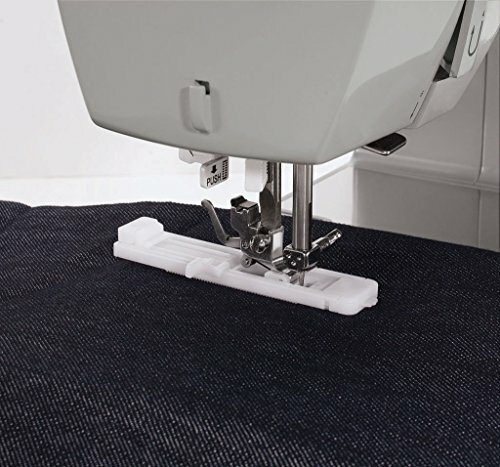 Adjustable presser foot pressure control: This machine makes sewing any fabric from delicate satin to thick canvas a breeze with adjustable presser foot pressure. Three needle positions: Different projects often require the needle to be repositioned; the 4423 accommodates your needs with a selection of three needle positions. Automatic reverse: Reinforcing stitches is super simple thanks to the built-in automatic reverse feature. You’ll save time by not having to reverse the fabric manually. All of the features listed above will streamline the sewing process and open up more ways for you to use your creativity. After mastering simple projects, you can utilize the 4423’s advanced capabilities for even more impressive results. The 4423 is highly durable and can handle heavyweight fabrics like corduroy, tweed, denim, leather and more. The strong motor and maximum sewing speed of 1,100 stitches per minute will allow you to power through projects with greater speed and efficiency. This machine has straightforward functionality for beginners, but also includes a variety of stitches and features to satisfy advanced sewers. The stitch selection of the 4423 machine isn’t as large as other available models and may not provide enough decorative options for some sewers. The bobbin can get jammed easily if you don’t take care with the uptake lever, and you may need to hold the beginning stitches to avoid thread tangling. While the inner frame of this machine is constructed of metal, the outer casing is made of plastic, which diminishes the quality of the machine as a whole. After analyzing all aspects of the Singer 4423 sewing machine, it’s clear that it delivers solid, reliable results for most any sewing project. 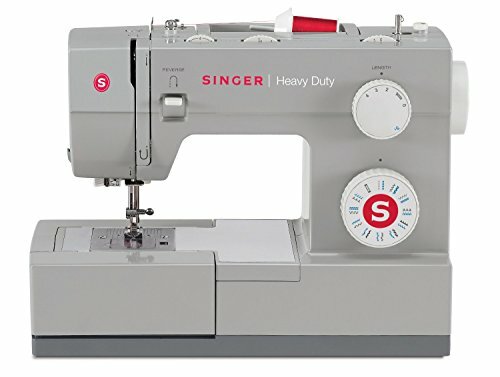 This machine can handle tough materials and enables you to use a number of different sewing techniques, whether you’re repairing a garment or constructing a quilt. The Singer 4423 is an exceptional value for sewers of all levels.